I just found a new sketch site called Sketchy Thursdays http://sketchythursdays.blogspot.com/ and decided to participate in their sketch challenge this week. I've had these wallet pictures on my scrap desk for over a month and this sketch was just calling their name! Check out their site and play along! Great page!! Love your site! Thanks for much for coming by to play! Your page (and your twins!) is too cute! Thanks for playing at Sketchy Thursdays! I love it! 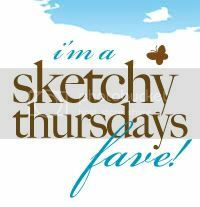 I'm so glad you found Sketchy Thursdays and I hope you join us often! Very cute page!! Thanks for playing along with us!